Kevin Drum posts this showing tax share by income in 1979 vs 2007. This purports to show that: 1) Our tax system is not progressive (i.e. 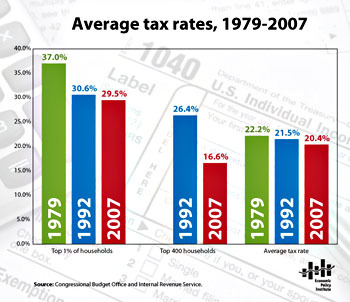 the rich don't pay outsized tax rates) 2) Tax rates on the rich have declined. The top income quintile household works more the 2x hours per year. And their reward for all that hard work? Higher marginal taxes!